I was invited to give a talk today at 'at-Bristol' as part of an exhibition called 'Bristopia', which looks at the future of Bristol as a centre for sustainable development.This is especially relevant as the city has just been declared European Green Capital for 2015. My talk was about the not-for-profit marketing cooperative that I'm a member of: the Forest of Avon Products. We try to promote local, sustainable wood use and recycling of timber and have been part of the woodworking scene in Bristol for 14 years. The co-op is based around the Bower Ashton Woodyard in Bristol and we are currently trying to secure an extension of our lease from the council. This would allow expansion of the companies who are already tenants (including renovating the derelict historic buildings in the courtyard around us) and would also open more workshop space for other designers and makers. Eventually, the woodyard could easily become a national or international hub of expertise in supplying and processing local timbers. It was great to catch up recently with Patrick, who works from a studio at his home in Bristol. It's one of those studios that has a very cosy feel to it, filled with books, clippings from magazines and objects that he has collected along the way. "Ashley Iles are my favourite make of gouges. I love 'em, but I know that you don't get on with them"
" No, I find the steel too soft and I can never get a decent edge on them, although I love my new Ray Gonzalez hooked skew"
Pity the other patrons sitting within earshot! We also discussed things like the need to not undersell yourself as a maker. When chatting to the Icelandic carver Jón Adólf Steinólfsson earlier this year, he also noted this. Jón Adólf said that when it comes to pricing his work, he really values the opinion of his partner Karin as she can see it's value with a more objective eye than he can, as the maker of the work. Both Patrick and I noted that there is definitely a tendency amongst many makers that we know in Britain to play down their hard-won skills and to underprice their own products, to the detriment of marketing their work. Perhaps Jón Adólf's attitude towards marketing yourself is also influenced by his contact with the American craft makers' world, which seems to be much more direct in some ways than the frequently more reserved British approach. Making an effort not to be too modest and not to undersell yourself seems like a good approach to take to me. Of course, however, one needs to be able to back up any claims that one makes! This photograph is on the back cover of the most recent edition of 'The Mortice and Tenon', which is the quarterly journal of the Carpenters' Fellowship. 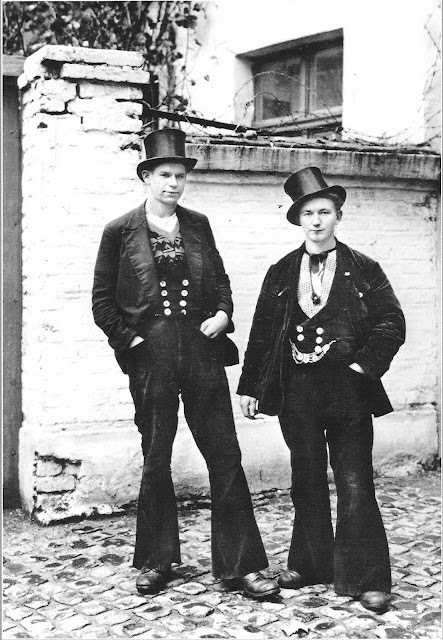 These are journeymen carpenters in Germany and the picture was taken in 1928 by August Sander. Journeymen carpenters still wear almost identical outfits today with justified pride and can be identified by them. Some other trades, such as builders and metalworkers, also have a tradition of travelling journeymen. They often wear similar clothes to those of carpenters and may belong to the same travelling 'clubs'. Details such as the colour of the fabric and designs on the belt buckles will differ from those of woodworking trades. 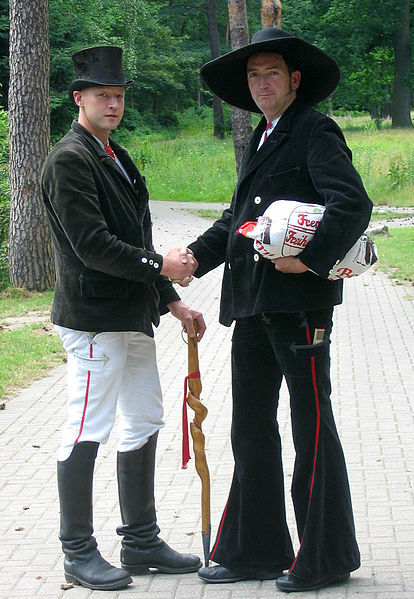 Some journeymen also wear different clothes to the ones shown above, such as breeches and knee-high boots. 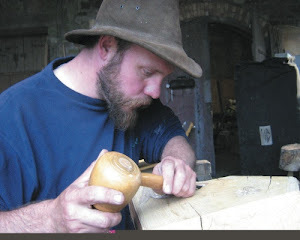 The tradition of the journeyman carpenter is a very long, very interesting and very well respected one in Europe. In Germany, once a carpenter has completed their professional training, they must travel for three years and a day and are forbidden to work within 50 km (about 30 miles) of their home town or the place that they did their apprenticeship. These rules may vary slightly between different clubs. If you'd like to see what happens when a travelling journeyman goes home, I've written about it in another post. Some join a guild or society and will usually follow it's strict code of conduct (Schacht). Others do not join a particular group, but are free-journeymen. They also observe the same codes of conduct, but are not bound to attend meetings and to observe other obligations that members of a journeyman society might do. 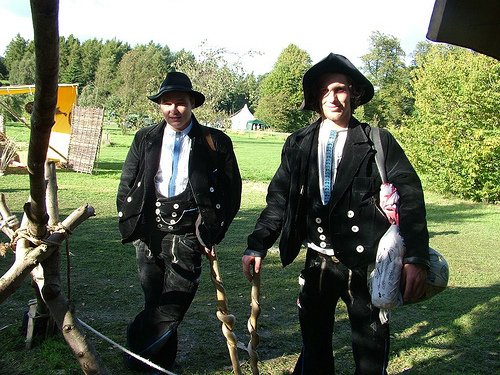 The carpenter journeymen of Germany are sometimes called 'Zimmermen' and can be easily recognised by the way that they dress and certain traditional objects that they carry. Like the two carpenters above, woodworking members of a 'guild' or club will often wear a black and white three-piece suit with, sometimes, an identifying tie. The blue ties worn by the two men above show that they are members of the 'Roland's Brothers' club, which was officially founded in 1891. The red ties worn by the men shaking hands in the photo above this one show that they are members of the 'Free Brothers' club, which was founded in 1910. These clubs are two of the older ones, the oldest and one of the most traditional of the clubs being the 'Righteous Brothers'. None of these clubs will admit female members. A journal (Wanderbuch) is carried which the bearer must not fill in. Those that they work with will fill it with notes but the journeyman will collect stamps from officials (at post offices for example) to show where they have been. They wear their hat (usually a black one) at all times when travelling and will carry a cloth bag holding their possessions and a cane (the Stenz) made from a twisted branch. I have seen photos of journeymen working in the baking heat of a workshop in Zanzibar but still wearing their black hats, black waistcoats and trousers. They are justly proud of what this dress code means and the tradition that they carry. Free journeymen will wear a white shirt with the collar tucked inside, but the rest of the outfit may be chosen at will. The wide-brimmed hat (similar to that worn by the men on the right in the two photos immediately above) is usually worn by someone in their first year of travelling. The wide brim would come in useful if someone was working above you and generating sawdust, as it stopped the sawdust getting into your eyes. However, such a large hat can be a bit more difficult to travel with and so more experienced journeymen wear smaller hats, which are also much more practical. If you look carefully at the left ear of the man on the right of the top photograph, you can just see a long earring hanging from it. This earring is called the Ohrhänger and is worn with pride, always in the left ear. Sometimes, it will show the tools associated with the wearer's craft. In the case of the carpenters, this could include tools that a carpenter uses - perhaps a pair of compasses, a saw, a carpenter's axe or a hewing axe. Other possible symbols include a hexagram (symbolising the geometry of carpentry) and two plumb bobs. One society, named Axt und Kelle, wear earrings showing an axe, a builder's trowel and the rising sun. The earrings serve several purposes. They identify the wearer as a trained carpenter and they could be used in the worst case to pay for their funeral if they died whilst travelling. If the wearer should bring the guild into disrepute by bad workmanship or behaviour, the earring can be forcibly torn out leaving a jagged scar and identifying them as a Schlitzohr. How is the ear pierced for the earring? With a hammer, a nail, a block of wood and large amounts of alcohol of course. Journeymen don't wear plastic buttons on their clothes. Instead, they are usually made from mother-of-pearl; a material with some value. These buttons could therefore be used in payment and as collateral if the wearer has no money. In France, the Compagnons de devoir are trade guilds. They are also very old, dating back to medieval times, but have different traditions to the German ones. The two systems were apparently closer in form to each other before the French system was reformed in the 1950s. The French guilds teach around communal houses which are strictly governed by 'The Rule'. Like German guilds, high standards of moral and professional conduct are expected to be followed. Travel is also important in acquiring knowledge and skills. It seems sad that in Britain, the tradition of the carpentry guilds has been lost to some extent. They were particularly important in medieval times as tradesmen would travel around Europe working on large building projects. However, in Britain the dissolution of the monasteries and the joyless actions of the puritans probably meant that work was too hard to find to sustain the guilds in the same way as those in mainland Europe. There are the livery companies of carpenters, of turners and of joiners based in London, the 'Worshipful Companies', but their good work is mainly in helping trainees financially by awards rather than by networks and practical training. Of course, many guild journeymen from Europe still travel to the UK, like the two gentlemen in the more recent photo above, and the Carpenters' Fellowship has strong links to the carpenter's guilds in both France and Germany. 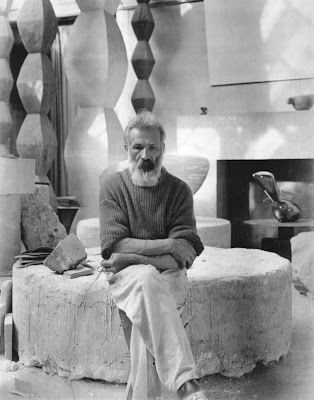 I was intrigued to read that some believe that Constantin Brancusi, one of the most influential sculptors of the twentieth century, came through a guild system. He left his home in Romania in 1904 and travelled to Paris but there is little record of him until he turned up there. Pierre Cabanne, in his book on Brancusi, believes that this journey may have seen the young woodworker helped and given shelter by the guild, which he could have been in contact with whilst studying and working in the town of Craiova. It's interesting to think that the ancient guild system in Europe could have profoundly influenced sculpture in this way even into the present day. There is a lot more about journeymen travelling in the German tradition on this blog post. It was written after hanging out with Nat and Leo, who were 'travelling in the tradition' at the time. The festival of stone ran for the first two weeks of June at the Harbourside in Bristol. As part of it, there was a carving competition which saw about 40 carvers given blocks of Bath limestone to carve. It was great weather for most of the competition and it was fantastic to be surrounded by and working alongside so many talented carvers, a situation that doesn't happen that often in what can sometimes be quite a solitary, studio-based pursuit. It also gave me the chance to meet Paul Caton, whose carved wooden bowls I've admired for a long time. It was an opportunity to meet skilled stone carvers from all over Britain, most of whom were very friendly and also enjoying the festival a lot. Some of them came from backgrounds that are not British, such as Samson Kizito who was born in Uganda and Tania Ivanova Tzanova from Bulgaria. It was very interesting seeing what everyone made of the theme: 'Emergence'. A stone worker from Austria, Dylan Thomas Craig, was also visiting and a group of stonecarvers from France had come over, along with their musician and DJ friends, who added a great atmosphere to the festival. Two of the French group, Laurent Donnadieu and David Bonhomme, also did a performance piece which involved moving huge blocks of stone using pulleys, accompanied by music. As Laurent and David began one of their performances, which involved setting the ropes into the pulleys, a drunk in the crowd started heckling them. He soon shut up when he saw the two of them move those rocks though! I must admit that it was quite a challenge to work in stone, which I haven't carved on this kind of scale for several years, especially when surrounded by such talented stone carvers. I feel that, to be honest, the sculpture isn't at the same level as most of the others at the festival but it was a very interesting thing to do and a chance to explore an unfamiliar material. I also managed to carve a good likeness of the model, which was the technical exercise that I really wanted to achieve. I don't feel ashamed of the sculpture and had great fun making it, although it obviously needs to be worked more to be anywhere near finished. It would be interesting to see it set into a structure, like a wall, in some way. It was great to be carving next to Pippa Unwin from South Devon, whose crocodiles won two well-deserved awards in the competition. I was also lucky to be sharing our tent with Iain Cotton (who is based near Bath). It was a great atmosphere in there and that made the festival even more enjoyable. ...as well as Sam Flintham's two dragons biting each other, which also won an award. Richard Mossman and Ben Dearnley are shown here working on a large sculpture to be installed in Ashton Court estate. It commemorates ' The Father of the Bicycle', James Starley . Ben was working on this throughout the festival, as a separate project to the competition, along with his students and some of the French carvers. Hot work! All in all, great fun and well worth being part of. Look out for the next festival of stone at some point in the future! St Davids Cathedral is tucked away in Britain's smallest city, St Davids in Pembrokeshire, which has a population of about 1,600 people. There has been a church on the site since the sixth century. Work began on the present building in 1181 and the nave roof and ceiling were built between 1530 and 1540. It managed to avoid the worst of Henry VIII's destructive excesses during the Reformation, largely because it housed the remains of his ancestor Edmund Tudor, Earl of Richmond. However, Cromwell's parliamentarians destroyed much of it in 1648 (the same sad, familiar story as with many of Britain's greatest works of art that happened to be in places of worship) although it was restored in stages between 1793 and 1910. I found it to have a 'cosier' feel than many of Britain's other cathedrals. It isn't as soaringly grand as some and the ceiling in the nave is made of wood, not stone. I really like the slightly humbler feel that I found there. The woodwork is pretty amazing as well! The carved stones to the left and right date to the 10th or 11th century and the one in the centre is a patterned ring cross dating to the 9th or 10th century. They are kept in the gatehouse. William the Conqueror visited the church at St Davids in 1081 to pray and probably saw these stones. These woodcarvings are next to the entrance into the nave. I'm guessing that they date to the renovations of the 19th or 20th century, but I don't know for sure. The wooden ceiling above the nave was carved from Irish oak in the 16th century and features carved pendants. The crucifix (or 'rood') is a 20th century replacement of an earlier one. One of my favourite parts of the cathedral are the carved wooden misericords in the choir stalls. These were carved in the late 15th century from oak. Dorothy and Henry Kraus, in their book 'The Hidden World of Misericords', comment on how many British misericords were produced during the fifteenth century and that they are notable for their precocity. At that time, the French or Belgian sets were inferior in quality to those being installed here. The name 'misericord' comes from the Latin for mercy and they are little seats which allowed the clergy to rest whilst standing for long periods of time during services. According to the Krauses, there are 3500 catalogued misericords in churches, chapel, abbeys and cathedrals throughout Britain. The collection at St Davids is one of the larger ones. The seats fold back down, so the misericord carvings were rather hidden and medieval carvers could carve subjects that were not as reverential and religious as elsewhere in the cathedral. Instead, some carvings poke fun at the clergy or illustrate little moral tales. We don't know what some misericords illustrate, as the sayings or stories that inspired them have been lost, but they still give a fascinating glimpse into the minds of the medieval carvers who made them. The lettering painted onto the backrests shows the names and offices of the medieval clergy who used those seats at one time. We had a bit of a get together last Friday at the yard where I have my studio. The purpose was to raise the profile of the Forest of Avon Products Cooperative and let more people know about what we do. There was homemade cider and axe throwing (but not at the same time!) and all the tenants at the yard got to show off some of our work. Bob Slade also demonstrated timber milling using a chainsaw mill. Joe Cooper, who owns Touchwood Enterprises, also delivered a presentation about the Cooperative to a group of invited guests. All of the tenants of the Woodyard are members of the FOAP Coop, which promotes sustainable, local timber use.